Speaker Says Movement Is Founded on Justice and Must Prevail. Struggle to Regain Rights. Victory Is Predicted. 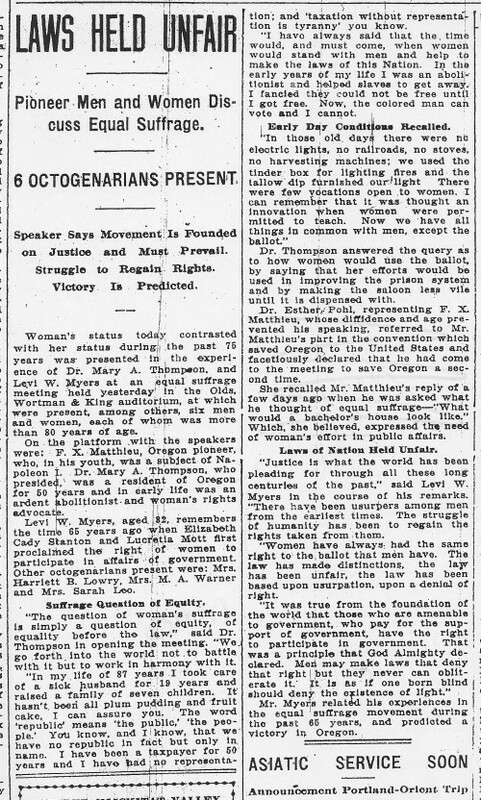 Woman’s status today contrasted with her status during the past 75 years was presented in the experience of Dr. Mary A. Thompson, and Levi W. Meters at an equal suffrage meeting held yesterday in the Olds, Wortman & King auditorium, at which were present, among others, six men and women, each of whom was more than 80 years of age. On the platform with the speakers were: F. X. Matthieu, Oregon pioneer, who, in his youth, was a subject of Napoleon I. Dr. Mary A. Thompson, who presided, was a resident of Oregon for 50 years and in early life was an ardent abolitionist and woman’s rights advocate. Levi W. Myers, aged 82, remembers the time 65 years ago when Elizabeth Cady Stanton and Lucretia Mott first proclaimed the right of women to participate in affairs of government. Other octogenarians present were Mrs. Harriett B. Lowry, Mrs. M. A. Warner and Mrs. Sarah Leo. “The question of woman’s suffrage is simply a question of equity, of equality before the law,” said Dr. Thompson in opening the meeting. “We go forth into the world not to battle with it but to work in harmony with it. “In my life of 87 years I took care of a sick husband for 19 years and raised a family of seven children. It hasn’t been all plum pudding and fruit cake. I can assure you. The word ‘republic’ means ‘the public,’ ‘the people.’ You know, and I know, that we have no republic in fact but only in name. I have been a taxpayer for 50 years and I have had no representation; and ‘taxation without representation is tyranny’ you know. “I have always said that the time would, and must come, when women would stand with men and help to make the laws of this Nation. In the early years of my life I was an abolitionist and helped slaves to get away. I fancied they could not be free until I got free. Now, the colored man can vote and I cannot. Dr. Thompson answered the query as to how women would use the ballot, by saying that her efforts would be used in improving the prison system and by making the saloon less vile until it is dispensed with. Dr. Esther Pohl, representing F. X. Matthieu, whose diffidence and age prevented his speaking, referred to Mr. Matthieu’s part of the convention which saved Oregon to the United States and facetiously declared that he had come to the meeting to save Oregon a second time. She recalled Mr. Matthieu’s reply of a few days ago when he was asked what he thought of equal suffrage – “What would a bachelor’s house look like.” Which, she believed, expressed the need of woman’s effort in public affairs. “Justice is what the world has been pleading for through all these long centuries of the past,” said Levi W. Myers in the course of his remarks. “There have been usurpers among men from the earliest times. The struggle of humanity has been to regain the rights taken from them. “Women have always had the same right to the ballot that men have. The law has bed distinctions, the law has been unfair, the law has been based upon usurpation, upon a denial of right. Mr. Myers related his experiences in the equal suffrage movement during the past 65 years, and the predicted victory in Oregon.